To say that the Xbox Adaptive Controller was deserving of this accolade would be quite an understatement. 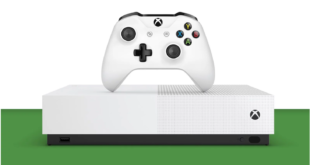 Having launched in September exclusively on the Xbox store, it’s a single step forward for accessibility and inclusion of disabled gamers like we’ve never seen before, and we can only hope the initiative proliferates and inspires other companies to put accessibility at the core of their vision. Microsoft’s program manager Evelyn Thomas, who heads up accessibility strategy and development for Xbox, travelled from the US to be at the Golden Joysticks and collect the award. Her passion for her work and what the Xbox team managed to achieve with the Adaptive Controller is undeniable from the start of our meeting in the comfy bar of her hotel, when we ask her to tell the story of how it all started. “There’s a gentleman by the name of Matt Hite [service engineer at Microsoft] and he had a lot of friends who were in the military. He was hearing stories about how they weren’t able to do things in their life that they used to do, due to injuries, and one of them was gaming,” she starts explaining. “He came across Warfighter Engaged, who builds custom gaming rigs for returning vets. 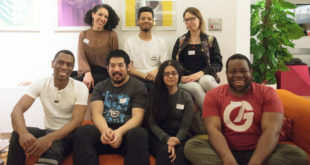 He worked with them and realised that while they were doing just amazing work, there were some gaps in some of the things that they were building that he felt he could probably help with. [The controllers] were fragile because they were hand-built, they were expensive, they were really hard to maintain and when they broke you’d have to have an electrical engineering degree to fix them,” she laughs. Around the same time, Microsoft was holding its annual Ability Summit, a two-days event focusing on accessibility and inclusion, internally and externally. Listening to Thomas tell the story, it feels like this was a very short process. But it was actually quite the opposite. The very first contact with Warfighter Engaged was in 2014 and from there the team also had to convince the top management at Microsoft that the project was worth their time – and money. From there, the growing team worked around three main principles, linked to the three different types of customers they wanted to serve: “The first one was the gamers of course. So it needed to be functional and extensible for them so that they could have it set up the way that works for them,” Thomas says. “The other one was caregivers, and caregivers aren’t necessarily all that technical in most cases. So it had to be drop-dead simple, easy to find, easy to set up, easy to use. Implementing all the features needed and finding the right design for the Xbox Adaptive Controller was no easy task and the team ended up in a bad position a few times, Thomas recalls. “We’ve been building controllers and Xboxes for a very long time. We know the forces that are required for the buttons. So we created the Xbox Adaptive Controller, had it manufactured, brought our first testing units into our lab and the machine started pounding away on the buttons and they immediately broke,” she laughs. Modularity in particular was at the core of the design process, to make sure it could adapt to the player’s exact circumstances. For this reason, the back of the controller has 19 3.5mm ports and two USB 2.0 ports, so players can purchase the accessories that fit their needs. “We’re not telling them how to play the game, they’re telling us. We want to give flexibility to the players. Xbox should be a place where everyone can have fun. With an emphasis on everyone,” Thomas says. The design of the product also look incredibly polished and slick. And there’s a good reason for that, she continues. The impact of the Xbox Adaptive Controller on the rest of the firm’s business goes beyond packaging and marketing though, Thomas adds. “It’s dramatically influenced everything, from how we greenlight projects to how we get our products through. It used to be: ‘Is there direct revenue, does that immediately result in bottom line dollars? Then we’ll greenlight it, otherwise move on’. And this has really changed leadership’s opinion about what are the right things to invest in. At the end of the day it’s the customer, right? It’s investing in something for the customer. 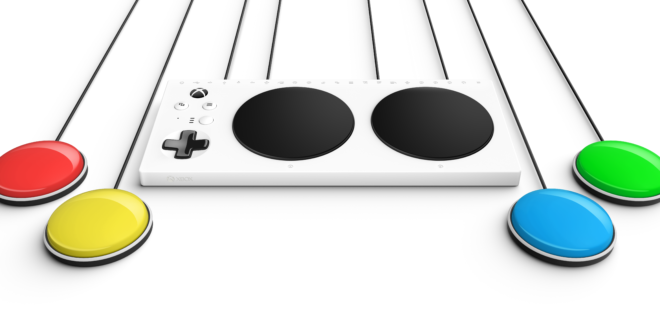 For the Xbox Adaptive Controller itself, the future looks bright and Thomas confirms a statement Xbox chief Phil Spencer made around the reveal of the device: the firm is very much open to the idea of sharing what it learnt with Sony and Nintendo. There’s a long way to go before gaming gets fully accessible, even at its simplest level – just look at the recent controversy surrounding Activision not including subtitles in its Spyro Reignited Trilogy. But Thomas reckons the industry can start with two simple things to improve inclusion and accessibility. “What ends with a product should start with people,” she starts explaining. “And studios, game developers, hardware developers, anybody who builds anything should really think about how they are in partnership from day one with the people who want to use their product. You can build in isolation, but you’re going to end up with something that really isn’t going to benefit them as much as truly embedding them in your decisions. So the strongest feedback I have for anybody is: think about your customer first, think about what they need and then build that in and you’re just going to win,” she laughs, before continuing. Xbox has partnered with charities from day one: Warfighter Engaged, as we already mentioned, but also AbleGamers and our UK-based SpecialEffect. The team also worked in partnership with Craig Hospital, a hospital in Colorado that focuses on people with spinal cord or traumatic brain injuries. “We’ve been in partnership with them to begin with and we’re expanding those partnerships out within the United States and external to the United States as well,” Thomas says. So if you’re reading this and you work for or know a charity, a hospital, an organisation that would benefit from having access to the Xbox Adaptive Controller, now is the time to get in touch with Microsoft. 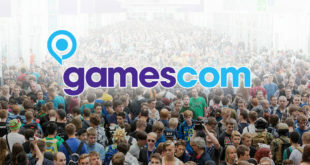 “We’re always interested in new partnerships that can actually help the gamer. And we know that the hospital space and the education space are spaces where this product would really benefit a lot of kids – and a lot of adults as well,” Thomas concludes.